Mrs P and I decided for various reasons we needed a few days away. So we planned a little trip to Yorkshire during the half-term break. We hitched up our folding camper and set out for a small village called Roecliffe, about 20 miles from York. We left early Sunday and decided to deliver a birthday present for my granddaughter on the way. The present was a slide that took up half the estate car. 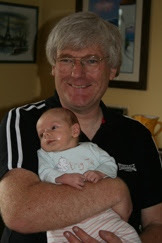 This meant I could also introduce Mrs P to my new grandson, Harry. I am discovering grandchildren are exhausting. We could only be there for a couple of hours but I don't remember being allowed to sit down for more than a minute. 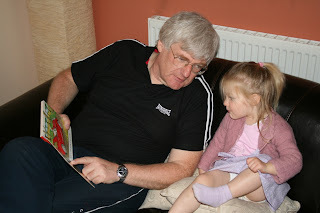 Eloise thought that hide and seek would be a good game to play with granddad. Have you ever tried hiding under a bed at 51? These were the types of games I played with my kids when they were young along with balloon football (proper football was banned indoors after I broke the glass door to the dining room), sardines, and wrestling. I really enjoyed being with Eloise and it was good to see Harry again. We arrived on site early afternoon. It had rained all the way to Yorkshire but as we started to set up the rain stopped long enough for us to set up dry and put the kettle on. The site was very nice, good clean facilities. Only one problem, it was next to a small industrial estate. Five AM next day and every day of our short stay lorries started their engines and seemed to park by our pitch to check their goods. Mrs P was not amused. Monday morning we spent time praying and reading the scriptures. We have learned over the past few years the preciousness of our times together with God. We don't make a big fuss about it and we try not to feel condemned if it doesn't happen every day but it is a special privilege for a couple to know God together. We have been amazed at God's goodness to us this past year. We reflected on how He has been leading us and some of the decisions we have taken which He has confirmed in so many ways. We wrote down things that we felt He had led us to do and will be sharing that with our prayer partners sometime soon. Monday afternoon we went into York. It is one of my favourite places. I love history, it was something I was always good at and it fascinated me. I first went to York when I lived in Yorkshire in the mid-seventies and it has never lost its charm. The rain held off and we were able to window shop and have coffee and toasted tea cakes. 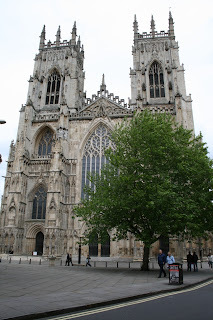 Whilst in York we received a call from a couple of dear friends inviting us to a meal in Halifax that evening so we accepted and went back to site to change and relax before meeting them. Mrs P dozed and I went for a stroll and had an idea. Our son Ben might want feeding up and Leeds is on the way to Halifax. I called him and in true student fashion he accepted. I thought this would be a nice surprise for Mrs P so didn't tell her. I thought she might get suspicious when she saw the route I took but she didn't. As we drove down the Otley road into Headingley she decided she might ring him. I managed to dissuade her. Not even turning into his road on the off chance we might see him gave her a clue. She saw him walking towards us and for her this was a great coincidence. Only when I said 'hop in then' did she realise what we had schemed between us. She really enjoyed the surprise. We arrived at the Chinese restaurant on time and were soon met by Philip and Ruth. I have known them for thirty-two years. Ruth was a young person in the church I led and Philip was her unsaved boyfriend. It was two years of coaxing and befriending before he made his decision to follow Christ. It was a powerful conversion one Sunday evening in November 1977. He is now a leader in that church and is a great personal witness to many. We had a great evening of food and fellowship and ended up talking to the owner for quite a while at the end. Philip managed to get him to agree to come to the church in return for the 35 person booking he had given him for a few weeks time. We dropped Ben off agreeing to pick up his things on the Wednesday on our way home to Birmingham. Leeds terms seem very short for him! Tuesday we spent more time with the Lord. This time we looked at where God is leading us. For me it was the USA for two weeks, then Mrs P, Jenny and me are in South Africa. What's after that? We are sure about some things but other things demand more thought and prayer and taking things a step at a time. Tuesday afternoon we decided to go for a walk before meeting up with a new friend in Thirsk who we first met in Honfleur, France. 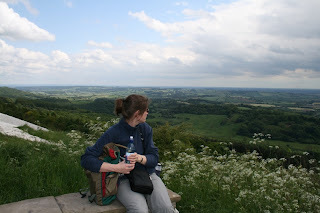 We were not far from a place we had been to about ten years ago, Sutton Bank. This hill is very steep. You can drive up it but it is so dangerous you are not allowed to tow anything up there. It is a 1 in 4 or 25% gradient and is very meandering. Once you get to the top there is a nature park centre with a café, shop and exhibitions. Several walks leave from the centre and we decided to do the one that goes along the top of the bank and gives you fantastic view towards the Pennines and across the Vale of York. The sun shone, we saw many different species of birds and enjoyed beautiful views of Yorkshire before heading back to the car. We drove from there to see our friend Gina. Gina is a terrific spiritual warrior with great insight and anointing. Gina is also almost blind. She has some peripheral vision but not much else. She prepared a great tea for us. We enjoyed good conversation that led naturally into a time of prayer and ministry to each other. I am so blessed in times like these. It should be the most natural thing for us Christians to simply pray and bless each other in this way. Wednesday morning the sun shone and we packed everything away, hitched up the camper and headed for Leeds and Ben to pick up crates and boxes. It didn't take long to fill the car with his things. Good job he wasn't coming back with us, there was no room! Arrived back to Brum in the rain, emptied the car and treated ourselves to fish and chips. Family and friends - a blessed few days.